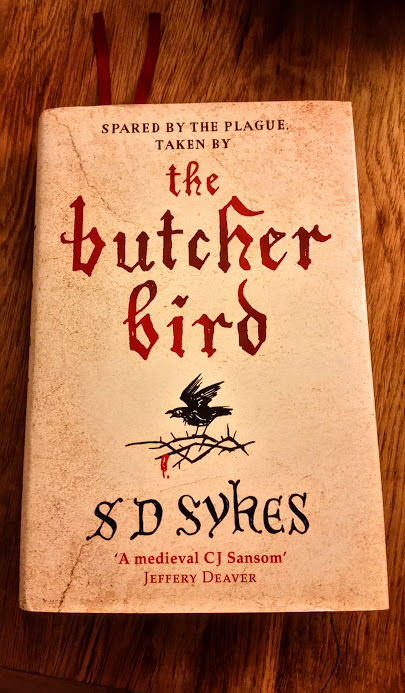 Once again, we’re back to fourteenth century England, with former monk, now bumbling lord and medieval crime fighter, Osawald de Lacy, ready to quell another murder in the sleepy Kentish village of Somerhil, in SD Sykes latest book,The Butcher Bird . Oswald has another mess on his hands as angry villagers are demanding higher wages in the wake of the Black Death. Facing a shortage of workers, while also being pressured by King Edward III’s 1351 Statute of Labourers, Oswald is between a rock and a hard place. He wants to raise wages but can’t get caught or he will face the wrath of the royal courts. If he doesn’t raise the wages, he risks losing his labourers and watching his newly inherited estate crumble. As all this is unfolding, and the dissenting voices get louder, a murder is thrown into the mix. A village baby is found dead and implaed on a thorn bush, and the superstitious villagers assume it’s a “Butcher Bird”, known normally for killing rodents and smaller creatures and impaling them on thorn bushes. They believe the bird is commanded at by a mad villager, overcome with grief after losing his wife and child in the plague. The villagers come after him, leaving Oswald in a race against time to solve the murder, and trying to buy time on the issue of raising wages, before the entire situation boils over into unstoppable mob violence. Unfortunately for Oswald, being surrounded by superstitious, angry villagers, is making his task doubly hard, and keeping the peace almost impossible. His sister Clemence, who has just given birth to a son, Henry, doesn’t help matters with her constant needling for Oswald to give over the Versey lands. Oswald’s mother, who provides most of the story’s comic relief, makes his investigation duly difficult by propagating the rumours of a monstrous flying bird snatching children to anyone within earshot. SD Sykes has provided another page turning tale of murder and betrayal, sprinkled with a liberal dose of dark humour. It’s wonderful reading; all the players are here: Oswald’s cantankerous sister Clemence, his snobbish mother (who is the Medieval version of Hyacinth Bucket from Keeping Up Appearances), the loyal, dim witted servant Humbert, acid-tongued village whore Joan of Bath, and a score of other familiar faces from Somerhill to flesh out the story and give it life. Oswald, by far, is still my favourite medieval super sleuth. He’s young, and still struggling with the role of Lord. The former unbelieving monk was foisted into the position after his elder brothers and father died during the Black Death. He’s also burdened with keeping his birth and true lineage a secret; so he feels like an imposter tenuously holding onto the De Lacy title, so long as his mother and sister maintain their silence. He intelligence, and lack of perception make for enjoyable reading. I find his means of handling (or more aptly, mishandling) the villagers a regular source of humour. Oswald is unsure of himself and definitely lacks lordly bravado. He’s definitely not the hero you expect, but his humanity, and flaws make him especially endearing and refreshing to read. As for the story itself, it may not be as fast paced as Sykes previous book, Plague Land , but this is not to its detriment; the story doesn’t plod along, it’s still captivating. I managed to plow through more than half the book in one day because I was engrossed by the strangeness of this story as it meandered along from Somerhill to London. Of course, like Oswald’s last story, there are always surprises and twists, and Sykes doesn’t disappoint, once again ending her tale with quite a shocking revelation. Sykes has also done her homework again, with regard to the economic turmoil after the plague. She presents an accurate portrayal of the difficulties faced by lords after the immediate fallout from the Black Death as labourers demanded higher wages due to the shortage of work, and lords wanted to maintain the status quo. Interestingly, without ruining the story, Sykes also presents an interesting look at the plight of women during the mid fourteenth century. Rich and poor, she highlights their lack of power in the characters of Clemence, Eloise Cooper, Joan of Bath and Agnes Salt, and demonstrates how each fought back in small ways to establish some modicum of control over their lives. If you enjoyed Plague Land, you will definitely enjoy this book; it picks up where the last novel left off but it can easily be read as a stand-alone. Sykes is pretty good at catching the reader up on past events without inundating them with too many details. She also knows how to write a good story; as in her previous book, her comedic timing is dead on. She has a talent for lifting the story up out of horror, tension, and misery, before taking the reader back around another dark corner. It’s effortless, truly enjoyable reading.